Discussing the PCG Top 100. Download: Episode 52: I have a complicated relationship with Bathtub Geralt. You can also subscribe on iTunes or keep up with new releases using our RSS feed. 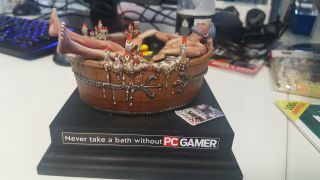 The PC Gamer UK Podcast is a weekly podcast about PC gaming. Thoughts? Feedback? Requests? Tweet us @PCGamerPod, or email letters@pcgamer.com. This week’s music is from The Witcher III: Wild Hunt.